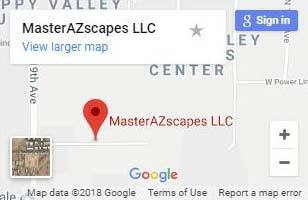 Whether you want to bring people together or just enjoy the evening alone, outdoor fire pits Phoenix homeowners depend on come from MasterAZscapes LLC. Our landscapers have been building custom outdoor fire pits for over 15 years. These can installed in an existing environment or built as part of a greater landscaping project. There are some wonderful benefits to outdoor fire pits Phoenix residents treasure. Create a mood with outdoor fire pits Phoenix trusts! You’ve alway got a gathering point – Fire pits are a great place to gather. In today’s modern world they provide a natural throwback where the focus lies on friends and family. There’s something about a fire pit that has inspired story tellers for generations. Gather your favorite people and enjoy their company without any digital distractions. Extend your season – With outdoor fire pits, Phoenix outdoor lovers can have a longer season. The warmth provided by a fire pit allows you to stay out later and longer. They can even be used for cooking. Marshmallows and kabobs are perfect for a fun outdoor fire roasted snack. Increase your home value – With outdoor fire pits, Phoenix residents get something they can use in the now, and profit from in the future. Fire pits add value to your home and can be a major selling point. For an enjoyable luxury with a longerterm payoff, nothing else compares. Get custom outdoor fire pits made for you! We have a number of incredible customizable options. From natural gas fire pits to propane fire pits, we can accommodate those who need a portable fuel system. Fire pits can be made out of brick, stone, and much more. Our technicians are incredible artists, and we can create a fire pit that is functional and beautiful. When you’re ready to take your property to the next level, call (623) 780-0474 or Contact Us for outdoor fire pits in Phoenix.